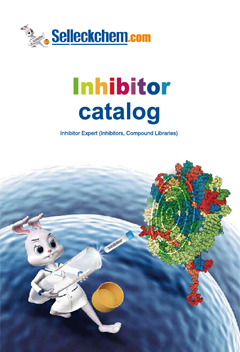 Vismodegib (GDC-0449) is a potent, novel and specific hedgehog inhibitor with IC50 of 3 nM and also inhibits P-gp with IC50 of 3.0 μM in a cell-free assay. SMOΔC captured on cholesterol beads in the presence of increasing concentrations of free vismodegib or 20(S)-OHC (h). Results from one of two independent pull-down experiments are shown. Nature, 2016, 535(7613):517-22.. Vismodegib (GDC-0449) purchased from Selleck. (B) qRT-PCR analysis and immunostaining of murine HSCs treated with GDC-0449 on culture days 4 through 7 (to inhibit SMO) or culture day 7 SMO-LoxP HSCs treated with adenoviral Cre on day 4 (to disrupt the Smo gene). Gastroenterology 2012 143, 1319-29. Vismodegib (GDC-0449) purchased from Selleck. Hh signaling controls metabolic reprogramming during liver injury in vivo. Immunohistochemistry identifies cells expressing the M2 isozyme of PKM2, a specific marker of glycolytic activity, ( C) inhibited in aged MDR2 -/- mice by GDC-0449. Gut 2013 62, 299-309. Vismodegib (GDC-0449) purchased from Selleck. GDC-0449, a preclinical Hh pathway inhibitor, inhibits replication of JFH1 HCV in a dose-response manner. (A) Huh7.5 cells were mock-infected (control), infected with JFH1 HCV alone, JFH1 HCV plus vehicle (JFHþ DMSO), and JFH1 HCV plus GDC-0449 5 μM concentration. After 72 hours, relative RNA expression was analyzed for HCV RNA, Shh, and Gli1. Results are expressed as relative fold expression with mock-infected expression indexed to 1, except for HCV RNA sample, in which case JFH1 HCV alone was indexed to 1. (B) Protein lysates were created from the above-described experiment. Antibodies to HCV Core, Shh, and a-tubulin were used for analysis. (C) The above experiment was repli-cated with var ying concentrations of GDC-0449 to assess dose-response of anti-HCV activity. Concentrations used were: 0 μM, 0.05 μM, 0.5 μM, 5 μM, and 25 μM. After 72 hours, relative RNA expression was analyzed for HCV RNA, Shh, and Gli1. Results are expressed as relative fold expression with mock-infected expression indexed to 1, except for HCV RNA sample, in which case JFH1 HCV alone was indexed to 1. *P < 0.05, **P < 0.01, † P < 0.005. Hepatology 2011 54, 1580-90. Vismodegib (GDC-0449) purchased from Selleck. 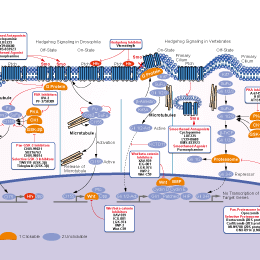 Relationship between Hh signaling and HCC in HBxTg. A, HCC nodules (circled) on the surface of the liver. B, the number of visible nodules observed on livers ( n = 6 HBxTg per group) after inject ions of vehicle (dark bars) or GDC- 0449 (light bars). Tumor numbers for individual mice are shown above each bar. The average tumor number is shown above each group. C, Western blot analysis for Gli2 in livers from transgenic mice treated with vehicle (-) or GDC- 0449 (+). D, staining for Gli2 and Shh on serial section s of tumors (T) and nontumor (NT) livers from HBxTg treated with vehicle (top) or GDC- 0449 (bottom). Magnification is ?00 for each panel and ?00 for each insert. Cancer Res 2014 72, 5912-20. Vismodegib (GDC-0449) purchased from Selleck. Phenotypic changes associated with Hh signaling in HBx positive and negative cells with or without GDC-0449. A, rep resentative images of HBx expressing cells that migrated through Matrigel basement membrane (×200). B, quantifi cation of the results in A (mean expression±D of 3 assays ). Cells were treated with DMSO (dark bars) or with GDC-0449 (light bars). P < 0.01; P < 0.02. C, anchorage-independent growth of Huh7X and HepG2X with or without GDC-0449. D, quantification o f the results in C (mean expression±D of 3 assays). Cells were treated with DMSO (dark bars) or with GDC-0449 (light bars). Cancer Res 2013 72, 5912-20. Vismodegib (GDC-0449) purchased from Selleck. Changes in markers of Hh signaling were determined in HBx positive (X) and negative (CAT) HepG2 and Huh7 cells treated with DMSO or GDC- 0449. A and B, qRT- PCR results are shown as the mean±SEM of triplicate experiments. P < 0.05; P < 0.01;†, P < 0.005. C, representative Western blot analysis of total extracts from the cells above. D, quantification o f protein levels (mean expression±SD of 3 assays for each marker). DMSO controls are the black bars and cells treated with 1 μmol/L GDC- 0449 are the white bars. Cancer Res 2012 72, 5912-20. Vismodegib (GDC-0449) purchased from Selleck. Hh inhibitor, GDC-0449, blocks hepatic Hh activity in the irradiated mice. (A) H&E staining shows less fat accumulation in hepatocytes in liver from representative irradiated mice with GDC-0449 (IR+GDC) (X40). (B) Relative liver weight/body weight of mice. (C) The values of AST and ALT are graphed. (D) QRT-PCR analysis of liver mRNA from DMSO (DMSO), radiation treated mice with (IR+GDC) or without GDC-0449 (IR+DMSO) for smo, and gli2 ((n≥4 mice/group). Mean±SD results are graphed. (E) and (F). Western blot analysis of Smo, and Gli2 (GAPDH was used as an internal control). Data shown represent one of three experiments with similar results (E: Immuoblot/F: Band density) (n≥4 mice/group). Data represent the mean±SD of three independent experiments (*p<0.05, **p<0.005). PLoS One 2013 8, e74141. Vismodegib (GDC-0449) purchased from Selleck. Hedgehog (Hh) inhibitor, GDC-0449, abrogates effects of Hh signaling within liver parenchyma and HCC nodules. A. Liver sections stained for Gli2 from representative DMSO- and GDC-0449- treated mice (40×). Quantitative Gli2 immunohistochemistry data in non-tumor livers of mice treated with DMSO or GDC-0449 (n = 9–10/group) are graphed as mean ±SEM (**p < 0.01 . The number of ductular cells with Gli2 positive staining were counted in each portal tract/section under 40×magnification. B. Tumor sections from the same mice were also stained to demonstrate Gli2. Results from representative DMSO- and GDC-0449-treated mice are displayed. Quantitative Gli2 immunohistochemistry data were generated by counting nuclear Gli2 positive ductular and hepatocytic cells in tumor sections under 40×magnification. Results are graphed as mean ± SEM Gli2-positive cells/40×high power field (**p < 0.01)C–D Quantitative reverse transcription-PCR (qRT-PCR) analysis of whole liver RNA from DMSO-(open bar) and GDC-0449 (black bar) treated mice. C. PPAR-c, a gene that is normally repressed by Hh signaling. D.Gli1, a gene that is induced by Hh signaling. Mean±SEM are graphed (**p < 0.01). PLoS One 2011 6, e23943. Vismodegib (GDC-0449) purchased from Selleck. GDC-0449 treatment reduces fibrosis in Mdr2 -/- mice. A. Immunohistochemical staining for α-SMA (top panel) and Sirius red (bottom panel) in sections of non-tumor liver from representative age-matched Mdr2 -/- and wildtype mice (10×). B. Pooled Hepatic hydroxyproline content of 2-52 wk-old wildtype (WT) and age-matched Mdr2 -/- mice (n = 3–5/group). Results in Mdr2 -/- mice were normalized to that of age-matched WT mice and graphed as fold change. Data are displayed as mean +/- SD (*p < 0.05)C. Non-tumor liver sections stained fora-SMA (top panel, 20×) and Sirius red (bottom panel, 10×) in representative DMSO- and GDC- treated Mdr2 -/- mice. D.Heptic hydroxyproline content of DMSO- and GDC- treated mice (n = 9/group). Results in GDC-0449-treated mice were normalized to that of DMSO vehicle-treated mice and graphed as fold change. Data are displayed as Mean +/- SEM (*p < 0.05). Inhibition of Hh signaling decreases osteopontin and osteopontin-responsive (CD44) positive cells in tumors and peritumoral tissues of aged Mdr2 -/- mice. A. Tumor sections from representative DMSO- and GDC-0449 treated Mdr2 -/- mice were stained to demonstrate osteopontin (OPN) Representative sections are displayed ( Right panel ). OPN staining was quantified by morphometric analysis of at least 5 HPF per tumor section using 20譵agnification (n = 5 mice/group). Results in the GDC-0449-treated group were normalized to that of the group treated with DMSO vehicle and graphed as fold change. Data are displayed as Mean 盨EM (**p < 0.01). B. Immunohistochemical staining for the osteopontin receptor, CD44, in peri-tumoral tissues of representative DMSO- and GDC-0449- treated Mdr2 -/- mice. (Right panel ) CD44 staining was quantified by morphometric analysis as described in A. Results in GDC-0449-treated mice were normalized to those of vehicle-treated controls and graphed as Mean盨EM (**p < 0.01). C. QRT-PCR analysis of liver tumor RNA from DMSO- (open bar) and GDC-0449- (closed bar) treated Mdr2 -/- mice for OPN (left) and CD44 (right). After normalization to results in the DMSO-treated group, Mean盨EM were graphed (*p < 0.05). (A) GDC0449 dose-dependent inhibition of Shh-stimulated Hh pathway activity in the presence or absence of 10 μM FA , or SmoM2 expressing cell lines. (B) Representative images of Smo::EGFP/Ivs: :tagRFPT cells treated with GDC0449 and Shh in the presence or absence of 10 μM FA. GDC0449 was coapplied at 111 and 1,111 nM respectively with Shh and Shh+FA . (C) Relative Smo::EGFP+ cilium count of GDC0 449’s dose-dependent inhibition of Shh ligand-stimulated accumulation of cilia ry Smo in the presence or absence of 10 μM FA. Measurements were performed in quadruplicate. Several hundred cells were analyzed in each sample to asses s the accumulation of Smo in the PC from data in (B). Data plotte d are mean (±SD). Scale bar: 5 μm. Chem Biol 2012 19, 972-82. Vismodegib (GDC-0449) purchased from Selleck. Quantification of Smo ciliary localization (A) and representative images (B) of Smo::EGFP/Iv s::tagRFPT cells treated with GDC0449 and Shh in the presence or absence of 10 μM Bud. In (B), GDC0449 was coapplied at 1.6 nM with Shh and Shh+Bud, respectively. (C) GDC0449 dose-dependent inhibition of Shh-stimulated Hh pathway activity in the presence or absen ce of 10 μM Bud. Data plotted are mean (± SD) from four biological replicates (A) analyzing over a thousand of cells or three biological replicates (C). Scale bar: 5 μm. Mouse medulloblastoma primary cells (U51669) showed inhibition of Gli1 by GDC-0499 in dose dependent manner. *P<0.01. J Neuroncol 2011 105, 475-483. Vismodegib (GDC-0449) purchased from Selleck. Flow cytometry of purpurin-18 accumulation in the presence of the following inhibitors in mouse and human ABCG2-expressing sublines demonstrated a similar pattern of inhibition. The fold value is defined as the accumulation of Pp-18 in the presence of an inhibitor divided by the accumulation of Pp-18 in the absense of any inhibitor. Data represent mean±S.D. of three observation. Vismodegib (GDC-0449) purchased from Selleck. Method: MDCKII cells are seeded into 24-well plates at a density of 3 × 105 cells per well and are allowed to attach. Medium is then changed to that containing different drugs (50 μM VP, 50 μM indomethacin, or 20 μM GDC-0449 in DMSO or DMSO alone as control, and nonfluorescent calcein-AM is added to a final concentration of 1.0 μM and incubated at 37 °C for 2 hours. Cells are then washed twice with Ca2+, Mg2+-containing Hank's balanced salt solution buffer and lysed by shaking in 0.01% Triton X-100 in PBS buffer for 1 hour at room temperature or overnight at 4 °C. The lysate is then transferred into 96-well plates, and the fluorescence signal caused by the cell-derived calcein is quantified spectrophotometrically with a SpectraMax M5 Multi-Detection Readerusing an excitation wavelength of 495 nm and an emission wavelength of 515 nm. All manipulations are performed in the dark. All readings are expressed as mean ?SEM normalized to the control. Scales SJ, et al. Trends Pharmacol Sci. 2009, 30(6), 303-312. Zhang Y, et al. Neoplasia. 2009, 11(1), 96-101. Tian F, et al. Anticancer Res. 2012, 32(1), 89-94. Wong H, et al. Clin Cancer Res. 2011, 17(14), 4682-4692. PF-5274857 : Smoothened-selective, IC50=5.8 nM. LDE225 (NVP-LDE225,Erismodegib) : Phase III for Hh-pathway activated relapsed Medulloblastoma (MB). GANT61 : Inhibitor for GLI1 as well as GLI2-induced transcription, inhibits hedgehog with IC50 of 5 μM, displays selectivity over other pathways, such as TNF and glucocorticoid receptor gene transactivation. Purmorphamine : Directly binds and activates Smoothened, and blocks BODIPY-cyclopamine binding to Smo with IC50 of ~ 1.5 μM. SB-334867 is a selective orexin-1 (OX1) receptor antagonist. Cyclopamine is a specific Hedgehog (Hh) signaling pathway antagonist of Smoothened (Smo) with IC50 of 46 nM in TM3Hh12 cells. GANT61 is an inhibitor for GLI1 as well as GLI2-induced transcription, inhibits hedgehog with IC50 of 5 μM in GLI1 expressing HEK293T cell, displays selectivity over other pathways, such as TNF and glucocorticoid receptor gene transactivation. Purmorphamine, which directly binds and activates Smoothened, blocks BODIPY-cyclopamine binding to Smo with IC50 of ~ 1.5 μM in HEK293T cell and also is an inducer of osteoblast differentiation with EC50 of 1 μM. Sonidegib (Erismodegib, NVP-LDE225) is a Smoothened (Smo) antagonist, inhibiting Hedgehog (Hh) signaling with IC50 of 1.3 nM (mouse) and 2.5 nM (human) in cell-free assays, respectively. Phase 3. Taladegib (LY2940680) binds to the Smoothened (Smo) receptor and potently inhibits Hedgehog (Hh) signaling. Phase 1/2. Glasdegib (PF-04449913) is a potent, and orally bioavailable Smoothened (Smo) inhibitor with IC50 of 5 nM. Phase 2. SANT-1 directly binds to Smoothened (Smo) receptor with Kd of 1.2 nM and inhibits Smo agonist effects with IC50 of 20 nM. Features:Attenuates SAG stimulation of Shh-LIGHT2 cells to a greater extent relative to other antagonists.